As a boy, I had terrible handwriting. This was not happily received at home, as my father had, at one time, been a penmanship teacher in the Philadelphia public schools. However, The Educator, a periodical from the Zaner-Bloser Company, arrived at our house every so often, and at some point the beautiful writing and calligraphy on its pages became an interesting challenge to me. So, while I was in the Navy during World War II, I used some of my spare time trying to emulate the Engrosser’s Script (a hand similar to Copperplate Script) and Old English lettering in the issues I had with me. I was discharged from the Navy in June of 1946, and while the GI Bill was there to provide funds, I could not possibly enter college until the winter term. With all that time on my hands, I was determined to spend some of it attending the Zanerian College in Columbus, Ohio. 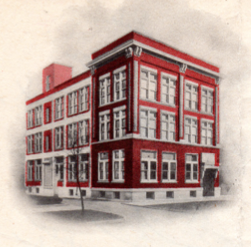 (This college of penmanship was part of the Zaner-Bloser Company.) At nineteen years of age, I took the train from Philadelphia to Columbus, arriving in mid-September 1946.